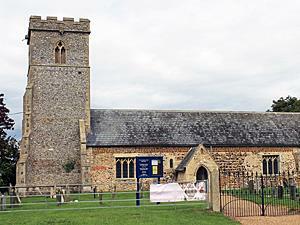 Pentney VillagePentney is located about 8 miles south east of King’s Lynn. It is in the valley of the River Nar, a tributary of the River Great Ouse. The age of the village is unknown, but it dates at least to the 3rd or 4th centuries, from which time there is evidence of a Romano-British local pottery industry. A Roman road and settlement in Pentney ran close to the river Nar. About a mile west of the village, on the north bank of the River Nar, is a gatehouse built of flint rubble with Barnack stone dressing, which is all that remains of the Augustinian Pentney Priory, established around 1130. Many of the houses and outbuildings in Pentney also contain Barnack stone taken from the Abbey. Between the village and the site of the Priory are the remains of a wayside cross that marked the route between the church of St Mary Magdalene in the village and the Priory. Pentney is located about 8 miles south east of King’s Lynn. It is in the valley of the River Nar, a tributary of the River Great Ouse. The church of St Mary Magdalene has stood on this site since Norman times, and was originally built as a small chapel but was doubled in length in the 13th or 14th century.